After a brief flight from Manchester to Rome and 2 hours heading east in a hire car we arrive in the beautiful weekend in Villetta Barrea, Italy. 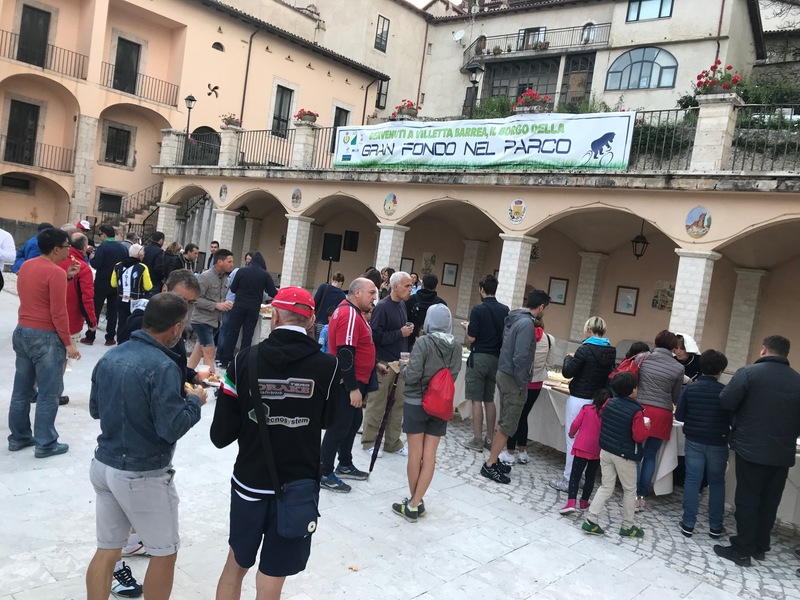 The population of the quiet traditional Italian village doubles over the weekend of the Gran Fondo El Parco when 600 riders take to the start line. We arrive into the village Saturday afternoon to meet up with the team from Sarto and see the latest innovations. This is the 3rd year of the Gran Fondo El Parco event and the 3rd year Sarto have sponsored it. Although Sarto’s HQ is near Venice (a good 8hours drive north of where the GF takes place) Enrico prefers to support this event with his local Sarto dealer, plus the surrounding roads are simply stunning. 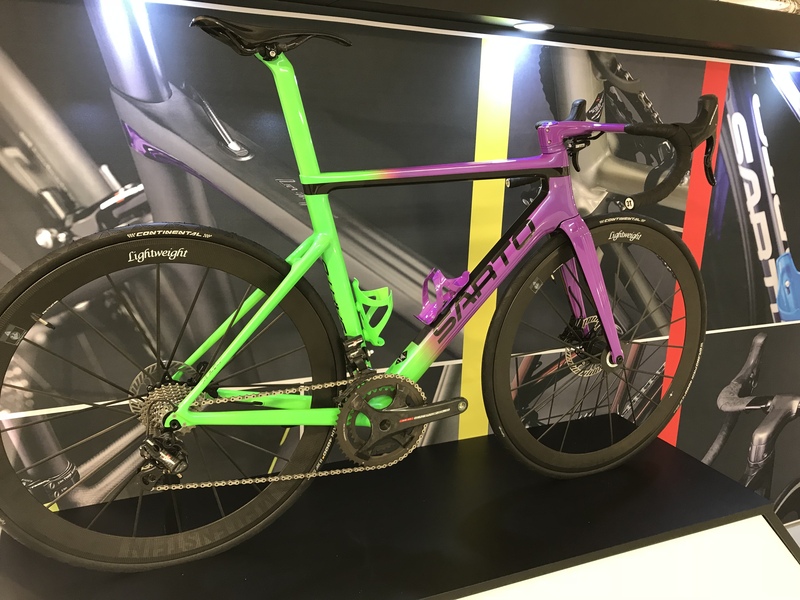 Enrico takes us around the range and talks us through new updates and colour options in the range. The exhibition area is in a small field on the edge of the village. As we finish the presentation a junior race is about to start, but not before the under 10’s stand in a circle to sing the national anthem (Perhaps my favourite anthem of them all!). The compare then hypes the juniors and off they race around a short course. The family vibe is great to see and the racing is competitive even at this level. Turns out that a Granfondo in Italy isn’t exactly the same as a sportive in the UK. 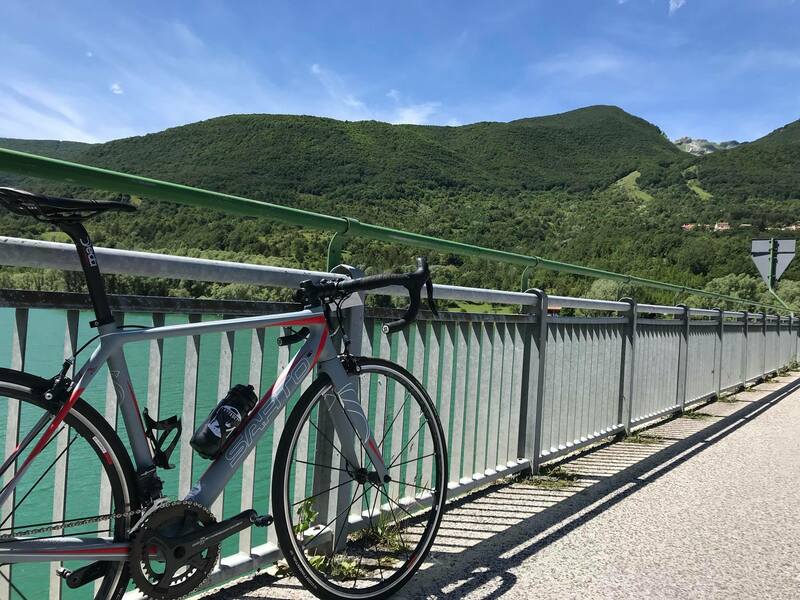 It’s competitive racing and is something the Italians take rather seriously as the gran fondo is subject to UCI regulations. Anti doping controls and spot checks were being undertaken all of Saturday at the sign on tent. 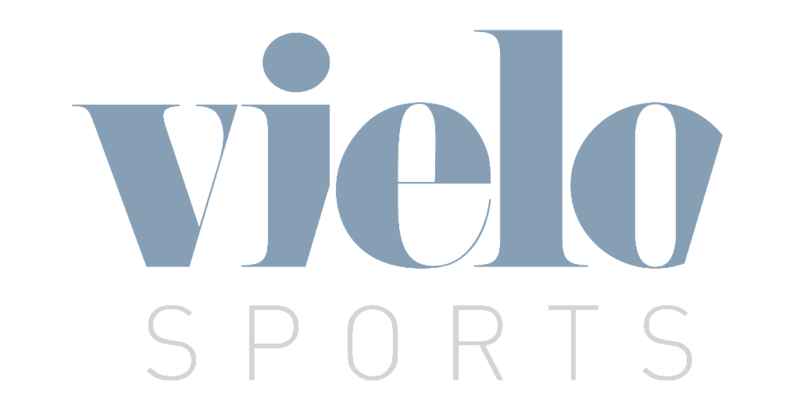 The granfondo also requires the need for either a medical certificate from your doctor or a full UCI licence (Eg basic Silver licence upgraded to full). If you don’t have a UCI race licence you will need a doctor’s certificate signed from home. Make sure to contact the organisers for a doctor’s template when you register your entry. No certificate? No ride! The 115km race (!) 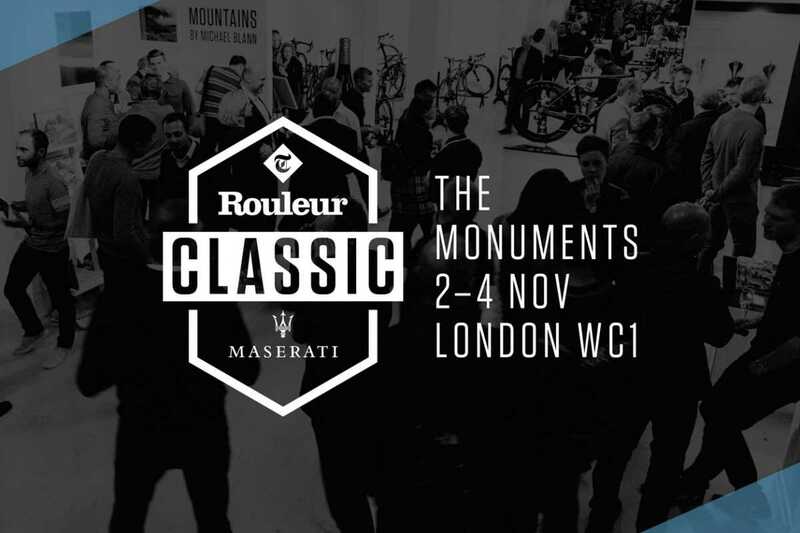 includes nearly 2000m of climbing concentrated into 3 note able climbs, the last of which makes up the final 10km of the race. There are 7 feed stops along the way, so you don’t need to be entirely self sufficient. The tables of snacks and water are a welcome relief, especially before the final climb. If 115km of racing isn’t for you, they also offer a ‘Giro Gourmet’ ride. A leisurely 50km with 5 pit stops to enjoy a selection of foods and drinks from the local villages. 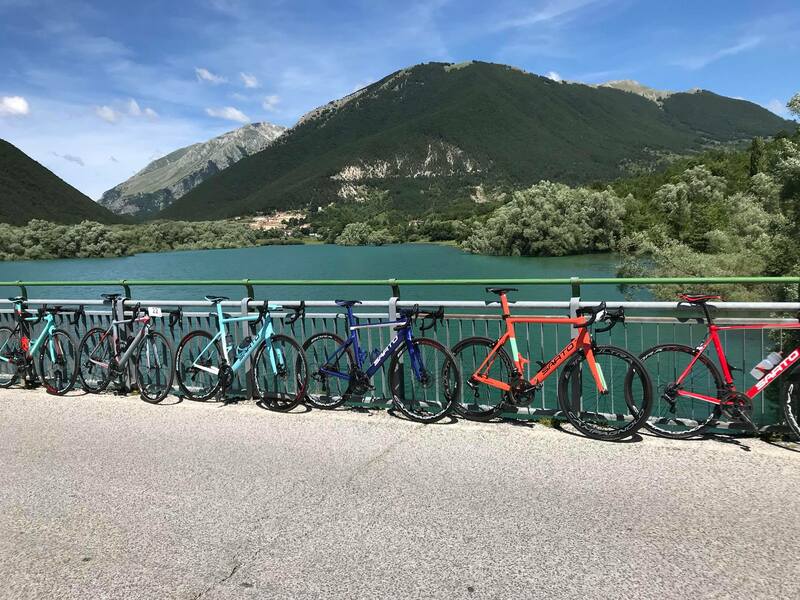 Two of our team went out for the full 115km, while I chose to join Enrico Sarto and a selection of other guests on the 50.That then left the afternoon to tweak saddle heights and positions on the beautiful bikes Sarto provided for us to ride. Saturday evening we enjoyed the Apertivo in the market square. Organisers had set up a row of tables with a vast selection of local meats, cheeses, wines and various baked breads and nibbles. It was welcomed by our group who had skipped lunch! Perhaps we ate too much at the party as we then sat down for dinner at 9pm in one of the hotels. A beautiful 5 course meal was presented to us with all signs of an early night thrown out of the window. The luxurious hotel was delivering such beautiful, comforting, delicious food that we couldn’t leave. All topped off with engaging company from around the globe reminding me that the social side of cycling is an incredibly valuable part of the sport. Sunday morning and after a brief breakfast we’re pickup our bikes, attach our race numbers to our beautiful new Sarto kit (Gifted to us after dinner and made by MEM) and made our way to the starting line. 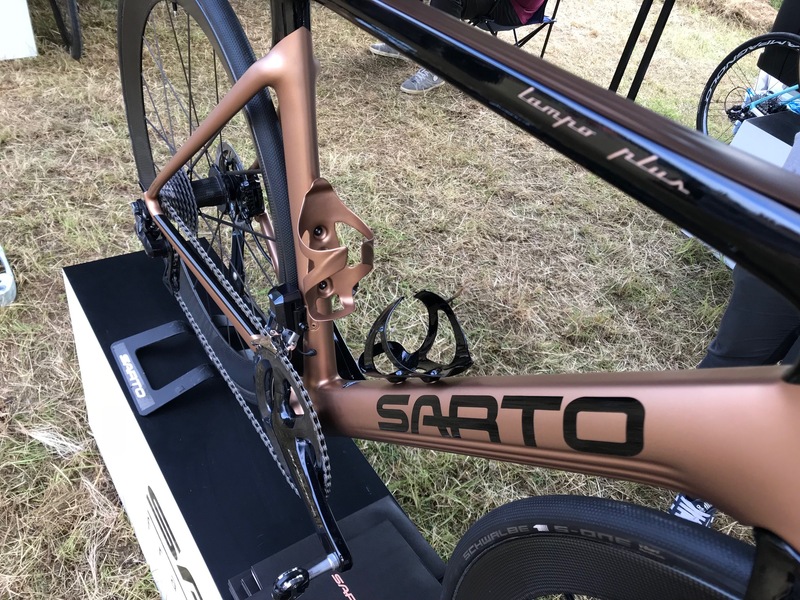 It turns out that the Sarto guests were all ranked in the first pen with the top 50 elite riders. It made for a stunning sight, probably the largest collection of Sarto bikes and customers in one location at one time. Each one different and custom to their own, embracing their creativity and preferred riding style. My Italian leaves a lot to be desired, but as we’re all stood in the pen waiting for the start we notice lull from the noisy PA system and a change of tone in voice as the crowds noticeably quieten. Glancing to the front we can see the local priest stood blessing the riders, and the event. I’ve never been in a blessed event before, not something the usual Sportive in the UK has for sure! This was immediately followed by a rendition of Queen’s We Will Rock you to energise the crowd in what was a noticeable step change in energy. The microphone is passed to the compare, who’s energy is infectious. As Hype men go he is incredible, I can’t understand a word of what he’s saying but his cadence and passion is giving us all goose bumps. Then suddenly we recognise the countdown …. 4, 3, 2, 1 And we’re off! No less than 10 meters down the road it’s immediately obvious who is riding for the social ride and who’s out to race. 600 riders whooping and hollering and jostling through the tight twisty village roads as we head out on a neutralising lap of the lake. The first climb quickly separates the elite riders from those looking forward to tasting some local cheese. It’s easy to get drawn in and although I’m on the social ride I find myself chasing wheels and racing up the first climb. A steady 3km climb takes no time at all and then we drop down to cross the lake. At this point the ride settles down and those chasing 115km are long gone. 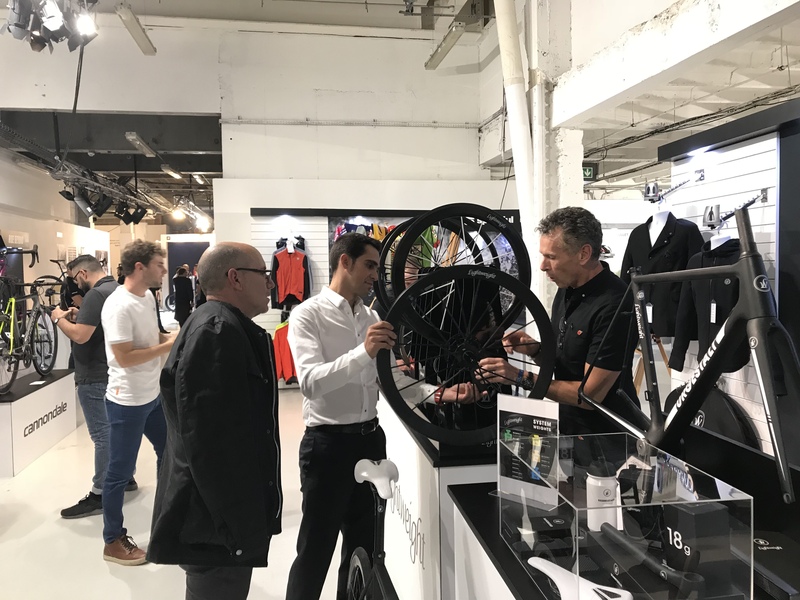 I find myself catching up to a group of Gourmet riders from the USA and Switzerland that retail Sarto and we settle into talking shop. We were so distracted by the conversation and the beautiful surroundings that we missed the first 3 checkpoints and were already at the village to turn back. Thankfully Enrico and a few others catch up and we roll back from Pescasseroli to the next coffee and cake stop. As we head back to the Villetta Barrea village the group decide the lake was so beautiful we have to go back to take a few pictures. I think it was worth it…. My ride for the weekend was a Dinamica rim brake with Campagnolo Chorus EPS. The bike was incredibly light and stiff, infact on some of the climbs it was effortlessly skipping along to my ever pedal stroke. 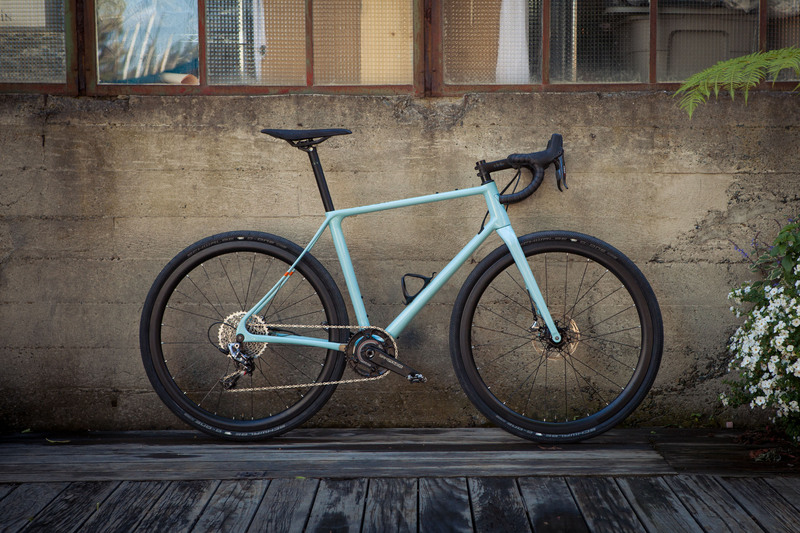 This is the stiffest frame in the Sarto range, and on some of the patched up mountain passes I could feel the big lumps and ruts through the 25mm tyres and alloy wheels. It’s more than likely that I noticed it more as I’ve been riding anything from 28’s to 38’s for more than a year. However show the bike anything smooth and put the power down and all the rough terrain was quickly forgotten, which is exactly what the Dinamica is for. Its stiff, its fast it’s for racing at speeds and delivers power with a sense of urgency, willing you up the next climb. It was incredibly agile through the sweeping switch backs and descents, inspiring confidence to leave the braking late and carry speed down the mountains. The fact I felt so comfortable on the bike that I’d ridden no less than 300yards the day before is a telling sign of how good it is. 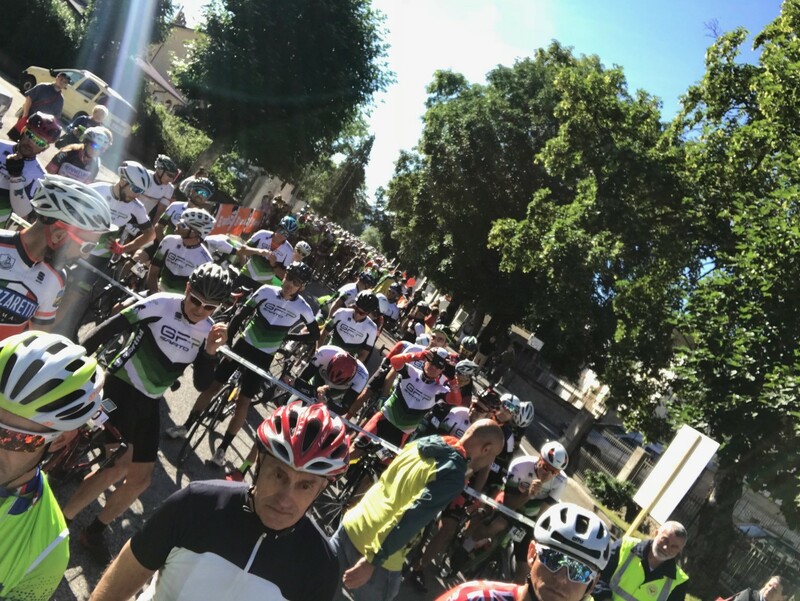 Sarto Gran fondo - Join us in Italy! 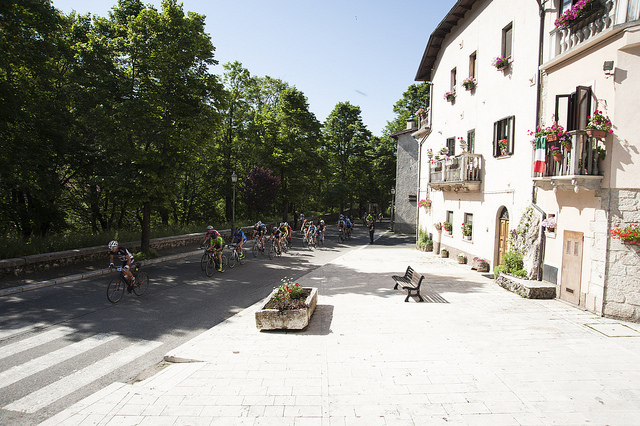 24th June 2018 sees the 3rd edition of the Sarto Gran fondo, in Villetta Barrea, Italy. 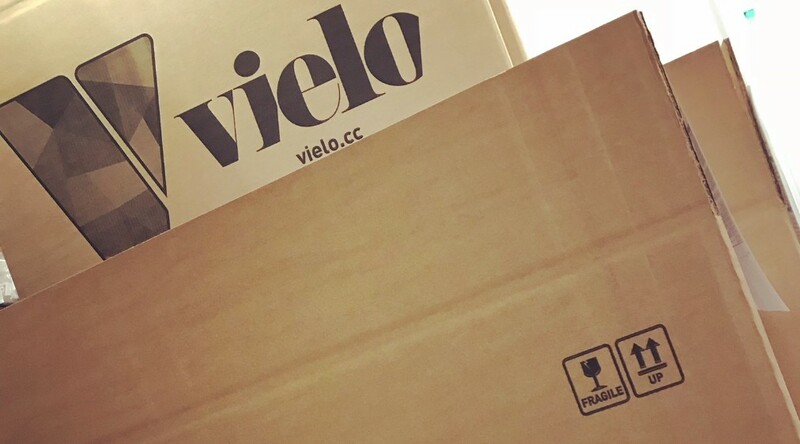 Trevor from Vielo Sports will be on hand over the weekend to support the team from Sarto HQ. 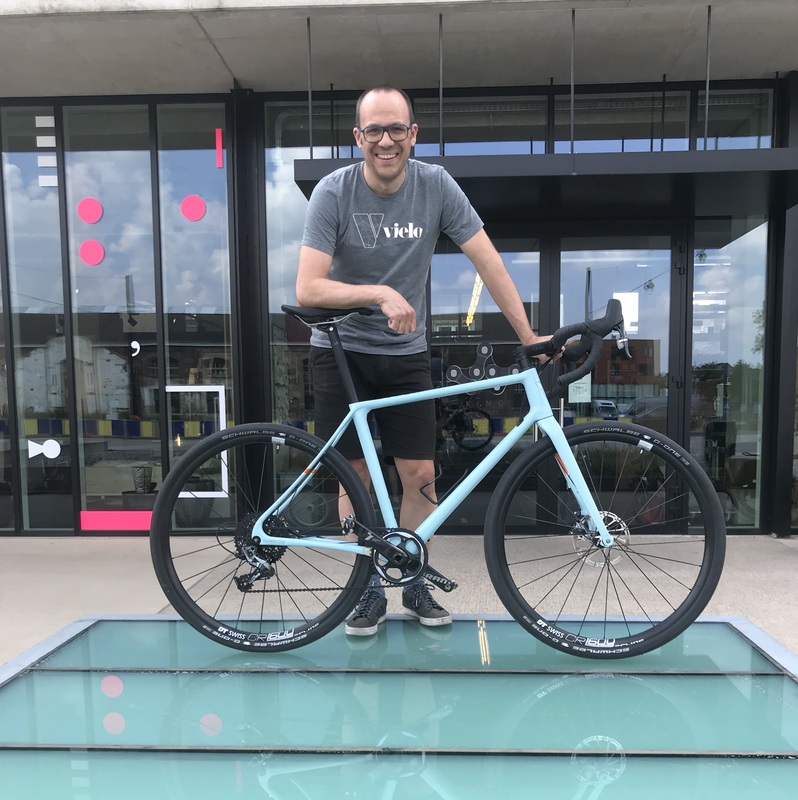 If you are looking for a beautiful place to ride a gran fondo this year , or an opportunity to see and test Sarto bikes then we would love to see you.